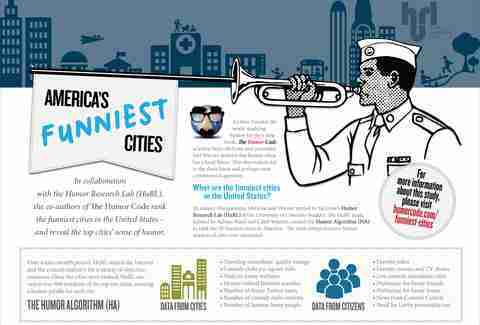 Science has finally confirmed what Chicagoans have long suspected -- they live in the most laughable city in the US. No wait, sorry, the funniest city in the US. Yes, funniest, at least according to researchers from the University of Colorado Boulder's Humor Research Lab (HuRL), who've perfected a "humor algorithm" to rank the nation's most humorous towns. Developed over a nine-month period, the algorithm/study -- which incorporated data from the Internet and surveys with 900 people -- measured factors like the number (and quality) of comedy clubs, radio stations, and snarky Twitter users, and how frequently residents exposed themselves to humor websites and/or their neighbors. While not a huge shock that the vaunted home of The Second City improv bested the field, you may be surprised at the rest of the top 10 (in order of their hilarity): Boston, Atlanta, Washington DC, Portland, New York City, Los Angeles, Denver, San Francisco, and Seattle. 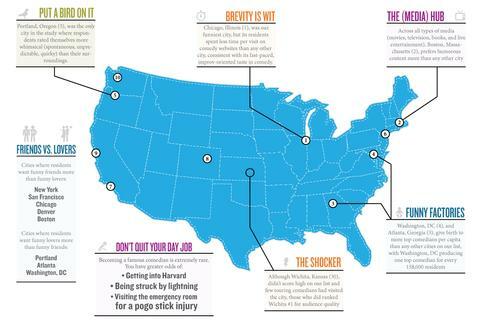 For more insight into why people from Boston are supposed to be funny even though they're kinda not, click on the infographic below. Chloe Pantazi is an editorial assistant on Thrillist's travel team. Having lived in Cambridge (the one in the UK) where everyone takes themselves far too seriously, she’s totally OK with living in the sixth funniest city in the US. Follow her on Twitter at @ChloePantazi.